Yoga has been an incredible way to help purify my skin from the inside out, but it’s so important for me to not forget the exposure to outside forces that can tear down my skin while I’m actually practicing. It seems like a taboo subject to talk about but I never go to class without something on my skin. A little tint, sunscreen and some mascara all go a long way when yoga practice turns to socializing and I’m out for the day. The key is finding something to wear on the skin that breathes and holds up to sweat but still looks luminous. I’m all about a hydrated glow and just enhancing my natural skin tone and texture. One of my favorite yoga studios in New Orleans has these big beautiful warehouse windows and often times I’m practicing while getting blasted with sun. In that case, it's all about prepping my skin before class. The first thing I do in the morning is shower, exfoliate my skin and cleanse. The number one priority for me right now with anti-aging prep is sunscreen. 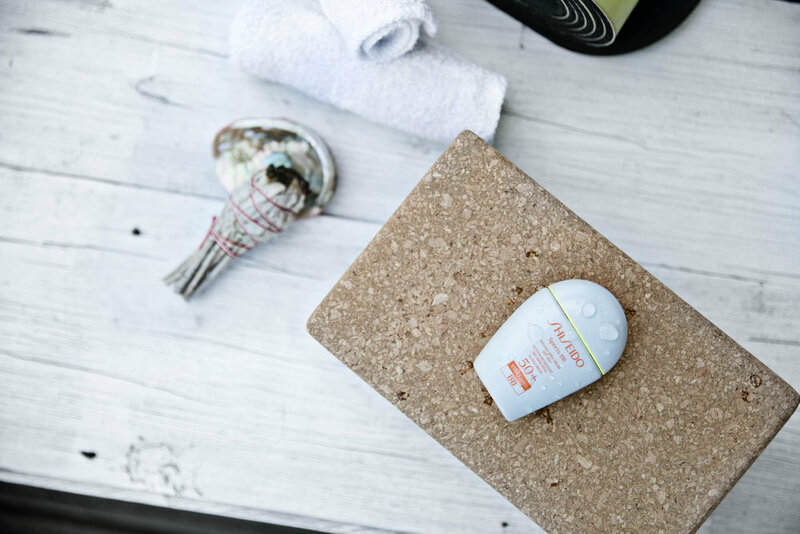 Shiseido has an incredible product called Sports BB WetForce that has SPF 50+ and actually strengthens protection with exposure to sweat after 30 minutes. It is the perfect amount of time for a hot yoga class and gives a lightweight tint to the skin for some coverage, which is a great way to multitask my sincere and makeup. I've been wearing the medium shade but I may look into adding the dark shade when my skin tans in the summer. I have it with me while I'm traveling as well so that I can paddle board or take a swim and still be camera ready since most of the time I'm shooting so much while being active. If I want to go a little further with makeup, I'll layer some coconut oil based eye polish, waterproof mascara and maybe a tiny bit of gloss on the lips. Since working out has turned into the new happy hour as a way to be social and get out and about, I think we can now all have the conversation of protecting our skin but also embracing natural with a little hint of that healthy glow! Don't forget to reapply after wiping down with a towel. This BB cream lasts for 80 minutes but I always make sure to bring it and reapply because I usually go to Whole Foods and run errands outside after class!